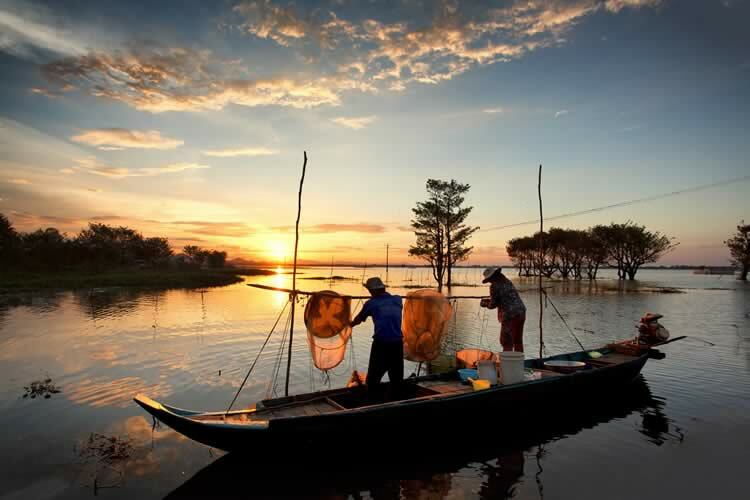 This 24 day journey from Hanoi to Siem Reap will showcase the essence of Vietnam and Cambodia including a seven night luxury cruise on the Mekong River. Fly from London Heathrow or Manchester with Singapore Airlines. Welcome to vibrant Vietnam. Settle into a two night Special Stay at your iconic hotel in Hanoi. Tonight meet your Scenic Tour Director and fellow travelling companions at your welcome briefing and dinner. Freechoice: Visit the History Museum and Hoa Lo Prison, or partake in an authentic cooking class. Alternatively, visit Ho Chi Minh Quarter and Mausoleum, including a visit to the Temple of Literature. Enrich: After attending a customary performance of Hanoi’s famous water puppets, learn the secrets behind this illusionary show thanks to your special backstage pass. Journey to Halong Bay and board the elegant Au Co for an awe-inspiring special two night cruise through the picturesque waters of this spectacular World Heritage-listed icon. Tonight enjoy a cultural demonstration of Vietnam customs. Enrich: Enjoy an exclusive wine tasting on board your cruise. Relax during your morning cruising before returning to Hanoi and a night at your hotel for a historical tour of the property. Freechoice Dining: Tonight choose to dine at KOTO on Van Mieu, or La Terrace at Sofitel. Alternatively, sample Ly Club. Fly to Hue, the former imperial capital. Take a cruise along the Perfume River to Thien Mu Pagoda before checking in for the night at your French colonial hotel in Hue. Enrich: This evening’s Royal Dinner is in a traditional private garden house accompanied by wine and Hue Royal Court music. Learn about Hue’s history via a visit to the Mausoleum of Emperor Minh Mang and the grandeur of Hue’s Imperial Citadel. Later, travel via the breathtaking Hai Van Pass to Hoi An where you will enjoy a three night, which includes a daily 90-minute spa journey as part of your stay. Step back in time as you take a walking tour of Hoi An’s World Heritage-listed Old Quarter before stopping at the home of a former merchant to learn all about what life is like in Hoi An. Freechoice Dining: Dine at the Cargo Club or embark on a culinary journey at Ancient Faifo. Alternatively, visit Brother’s Café and enjoy Asian and Western fare. Freechoice: Visit the ancient temple ruins of My Son. Alternatively, enjoy an interactive cooking class at Red Bridge Restaurant or cycle to a nearby farming village. A free afternoon allows you to visit one of the many tailors in town. For a different view of the city, travel along the Saigon River to the Cu Chi Tunnels and learn about the underground labyrinth of war-time passageways. After lunch, stop for some bargaining at Ben Thanh Market. Drive to Siem Reap and check into your hotel, your stylish three night Special Stay. Enrich: Take your premium seat at the colourful Cambodian Circus, Phare. Enrich: Marvel at sunrise over the magnificent Angkor Wat before moving to a special location for a champagne breakfast with food prepared by a local NGO supported bakery school. After breakfast, transfer to the airport for your flight home with either Emirates or Singapore Airlines.